It's beginning to look a lot like Christmas. Well, here in Michigan it is (we just got a good amount of snow fall this weekend). I hope that wherever you are, you are feeling and enjoying the holiday spirit with the ones you love and cherish. I am so excited to share this idea with you. We made a bunch of these up this year for the kids to give to their teachers, their bus driver and a few of their special friends at school. They are just a fun, little gift that will warm the hearts (and bellies) of the recipient. I love that they are pretty inexpensive to make and super easy to throw together. You can click HERE for more of my FREE holiday printable labels and gift tags. They're great for presents or homemade goodies. 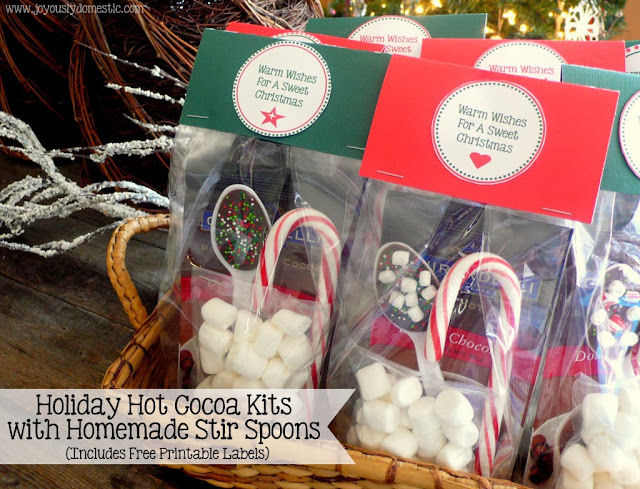 You can do just one of the hot cocoa packages, one candy cane and one spoon in each bag ... or double everything up so there's enough for two people/servings. Decide how tall you need each bag to be so that everything fits inside. Cut the bags 2 - 3 inches taller than needed. Fill the small treat bags with the mini marshmallows. Fold over the top of the bag and staple shut in two places. Place everything inside of the larger bag. Fold the top of the bag over just a little and staple shut in two places at the ends. Then, fold the colored cardstock (trimmed to fit) over the top of the bag - "trapping" the top stapled portion of the bag in between the folded cardstock. Staple the folded cardstock to the bag in two places. 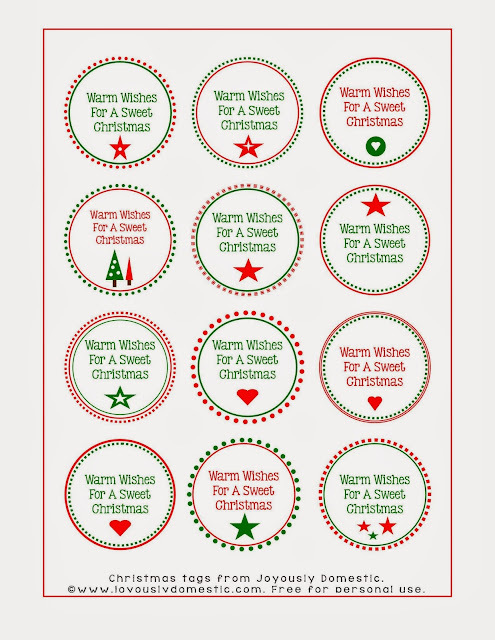 Attach the round label to the cardstock with glue. I used a hot glue gun to do this. Line a large baking sheet with a piece of wax paper or parchment paper. Melt the chocolate in the microwave in a glass bowl. Melt in thirty-second intervals ... stirring between each interval. Just be sure to heat in short increments of time so that you do not burn the chocolate. Once melted and smooth, add in the oil and stir to combine. Use another spoon to add some chocolate to the oval "bowl" portion of the spoon. Whirl the spoon you'll be decorating around a little to coat the whole oval "bowl" portion. While the chocolate is still warm, sprinkle on your topping(s) of choice. You could use sprinkles, decorating sugar(s), crushed candy canes, nonpareils, tiny marshmallows or mini chocolate chips. Place each finished spoon onto the paper to cool and set. Use the sides of the baking sheet as a ledge to rest the spoon handles on. This will keep the spoons level so that the chocolate will not run off of the sides while drying. Once completely dry, store in an airtight container until use. Here's another homemade Christmas gift idea. These are great for the kids to give out to their friends at school! Thank you, so much, for sharing! Your kindness and generosity in doing so have really come to my rescue as I prepare for an extra-frugal Christmas.